PTC's Internet of Things (IoT) and Augmented Reality (AR) solutions have provided a competitive advantage for organizations across the globe. Join ACS and PTC as we bring these ground breaking technologies to Iowa. Register here to discover how these solutions can produce data and insights from equipment that has historically been difficult to monitor. Explore how AR can reinvigorate employee training and machine maintenance. Register now to reserve your spot at this exclusive launch event. In 2017 Gartner released the first-ever Gartner Magic Quadrant for Industrial Internet of Things Platforms. 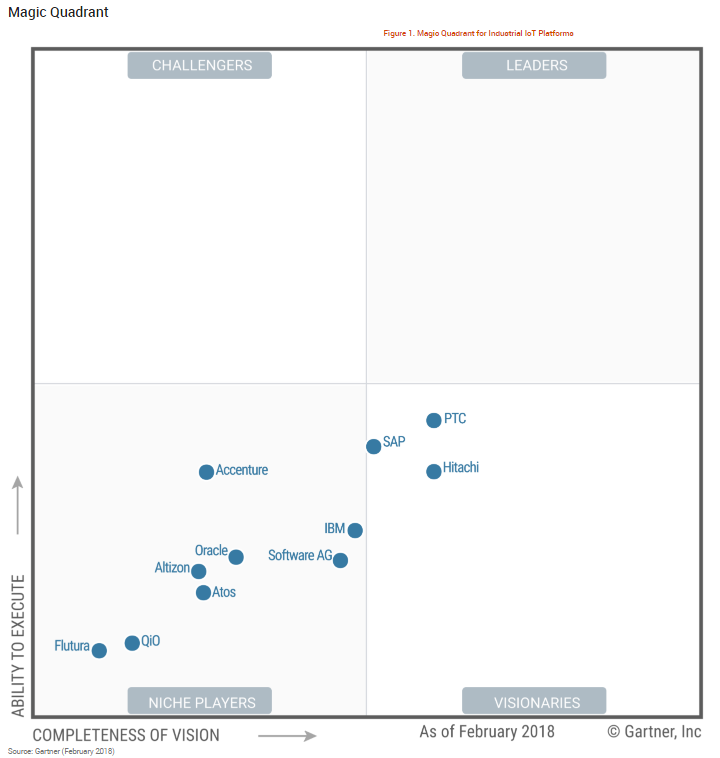 In this Magic Quadrant PTC was recognized as the organization with the most complete vision and level of execution. Gartner placed PTC in the "Visionary" quadrant. Gartner highlighted PTCs experience in the Manufacturing Industry stating "
PTC's strength lies in its experience with the manufacturing sector based on its core applications for PLM, computer-aided design (CAD), service life cycle management (SLM) or application life cycle management (ALM) customers. Based on this experience, PTC tends to focus on asset monitoring, predictive maintenance and operational excellence solutions. To develop these solutions and industry knowledge, PTC ThingWorx continues to grow and nurture a global ecosystem of technology partners, solution providers and global system integrators." Required Disclaimer Gartner does not endorse any vendor, product or service depicted in its research publications, and does not advise technology users to select only those vendors with the highest ratings or other designation. Gartner research publications consist of the opinions of Gartner's research organization and should not be construed as statements of fact. Gartner disclaims all warranties, expressed or implied, with respect to this research, including any warranties of merchantability or fitness for a particular purpose. With over 30 years of experience understanding things in their digital form, and over $1 billion in investments in bringing that information back into the physical world, PTC has a unique, big picture view of how this technology can advance your business today. Their leading industrial innovation platform and field-proven solutions and services, help companies design, manufacture, operate, and service things for a smart, connected world. The advancements that are being made are even helping companies, developers, and partners to create entirely new tech-based business models.